On Tuesday, Oct. 30, a standing-room crowd came out to support the Fair Work Week bill sponsored by Councilperson Helen Gym. 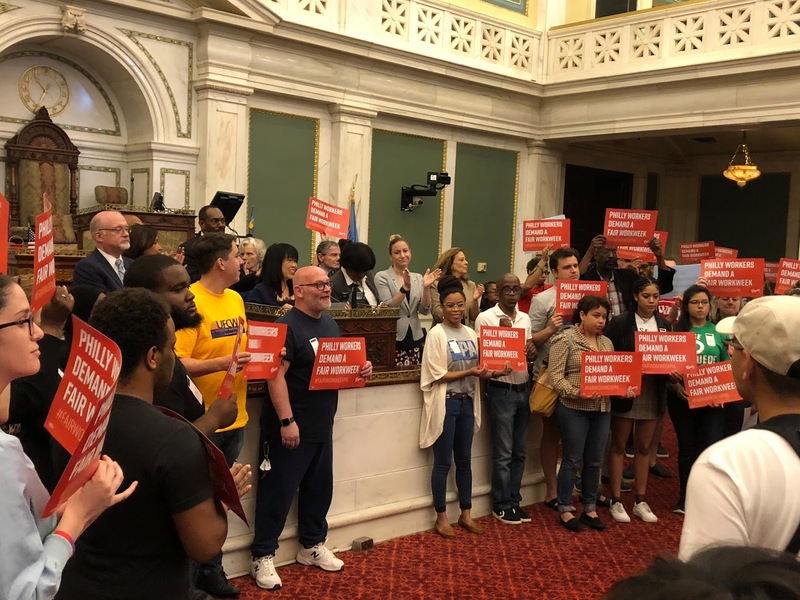 The proposed legislation would impact the working conditions of the 130,000 employees in Philadelphia’s retail, food service and hospitality industries. Currently, according to the California Institute for Research and Employment, 62 percent receive their schedules with less than two weeks’ notice and 53 percent have worked “clopenings,” consecutive closing and opening shifts with little time in between to commute, eat and sleep. After three hours of testimony, much of it from service sector employees and their advocates about the devastating impact of unpredictable schedules on families, the Committee on Law and Government voted 6 to 2 in favor of moving the bill out of the committee to the full Council, with Councilmembers David Oh and Brian O’Neill voting no. The bill as amended mandates that companies with more than 250 employees and more than 30 locations give workers their schedules with 10 days’ notice and requires compensation when work hours are changed without the mandatory 10 days notice. (The number of days of notice will rise to 14 starting in January 2020.) The legislation also requires employers to give work to currently employed part-time workers before hiring new employees. The large turnout for the Oct. 30 hearing on the Fair Work Week bill suggests widespread support by community organizations, including Northwest Philadelphia’s Neighborhood Networks, and especially by women’s organizations who see the Fair Work Week bill as very much a woman’s issue. The Philaddelphia Commission for Women has made support for the Fair Work week legislation one of its priorities for the upcoming year. The Philadelphia chapters of the National Organization for Women and the Coalition of Labor Union Women spoke in favor of the bill. With unpredictable weekly schedules, childcare becomes an ad hoc situation, cobbled together at the last minute. Since many centers require caregivers to pay a weekly or monthly fee, regardless of how often the child attends, holding a spot in a childcare center is often infeasible for workers who do not know when, or even if, they will work that week. Further, workers with unstable schedules may not qualify for childcare subsidies due to fluctuations in income and work hours. To qualify in Pennsylvania, parents must work 20 or more hours a week, or work 10 hours and go to school or train for 10 hours a week. Relying on family, friends and neighbors to provide childcare – as most workers in low-wage jobs must do – is complicated by the fact that their childcare providers may also be balancing an unpredictable part-time work schedule at their own jobs. Vanessa Fields, co-chair of the Policy and Advocacy for the Philadelphia Commission for Women and a member of the Coalition of Labor Union Women, emphasized the Fair Work Week bill’s support for women struggling to escape poverty. With greater control over their working hours, they might obtain a GED, a college degree or other training that would enable them to obtain a better paying job. 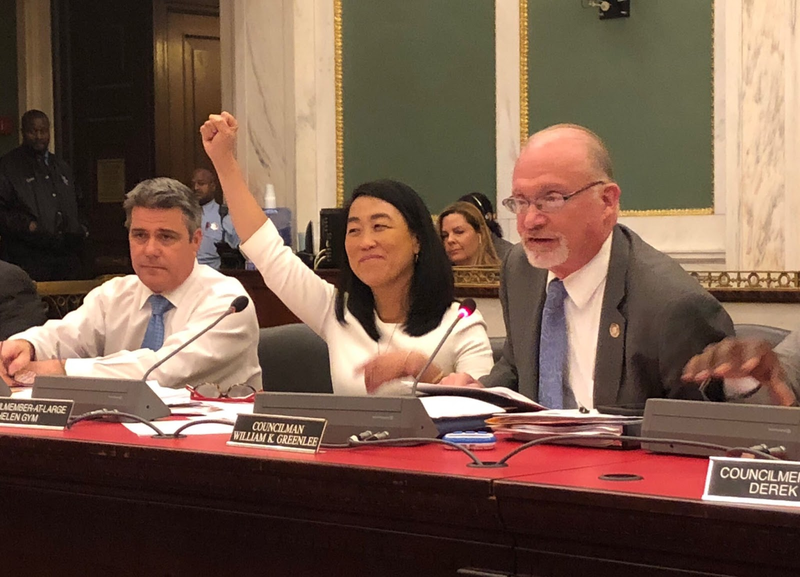 Objections to the bill came from Councilman Allan Domb, who expressed concerns about whether the legislation would make Philadelphia businesses less competitive with the surrounding suburbs. Representatives from the hospitality industry argued that the hotel industry was especially vulnerable, given the unpredictable nature of hotel reservations. Councilwoman Cindy Bass raised concerns about whether the city had the resources to enforce the bill. Deputy Mayor for Labor Richard Lazer replied that Mayor Kenney supported the goals of the bill and believed resources could be made available to ensure successful implementation. He also stated that the Mayor would like to see some unspecified amendments to the bill. Councilwoman Blondell Reynolds-Brown expressed concern about the bill’s impact on existing collective bargaining agreements. However, Pat Eiding, president of the Philadelphia AFL-CIO, and other representatives of organized labor who spoke in favor of the bill, did not share Reynolds-Brown’s concerns. Since many low wage workers are not represented by unions, until these workers become organized, legislation will be the route to improving working conditions for most low wage service sector employees. There are apparently now 10 councilpersons who have expressed support for the bill, one more than the nine necessary for passage. In addition to Helen Gym, there are seven co-sponsors: Jannie Blackwell, William Greenlee, Bobby Henon, Kenyatta Johnson, Curtis Jones, Maria Quiñones Sánchez and Mark Squilla. In an interview on Oct. 31, Councilman Derek Green indicated his support. He noted that he and Councilwoman Cindy Bass both voted to move the legislation out of committee with a favorable recommendation. A vote on the bill is scheduled for Nov. 29 to decide whether Philadelphia will join the other states and municipalities, including San Francisco, Seattle, New York City and Oregon in passing a Fair Work Week bill. Karen Bojar is a resident of Mt. Airy and a long-time Democratic Committee person. She is currently Vice-Chair of the Philadelphia Commission for Women.